I had my first popover this past summer. I was out of town for a small procedure to donate cells for Be The Match. For dinner I treated myself to a nice meal. The restaurant seemed pretty proud of its popovers so I decided to try one. Why not, right? They must be famous for them for a reason. My meal arrived, a delicious fish dish with brussels sprouts and some sort of root veggie puree. Then there was this giant mushroom of a popover. It was so big it needed its own plate. Between it and the cinnamon butter it came with, very little of the bread plate was even visible. It ended up serving as my dessert that night and piqued my curiosity. 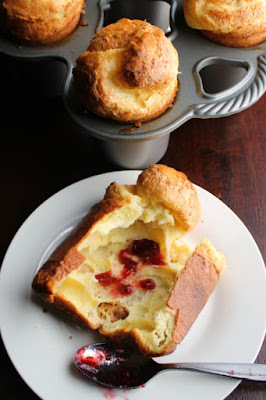 So when I got a beautiful popover pan from Nordic Ware, I couldn't wait to give it a try. They were so much easier to make than I had imagined. 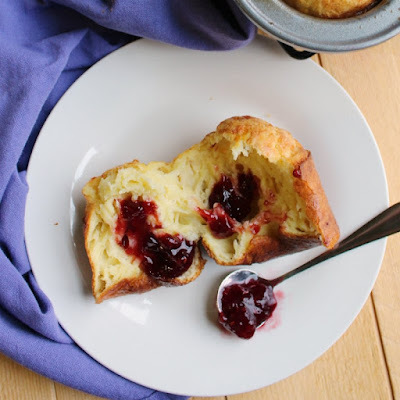 You just stir together some pantry staples and spoon the loose batter into the pan. The heat of the oven makes them grow and brown in the most delicious way. I really can't tell you enough how easy they are to make. Eggs play such an important role in this recipe. They are a major player in the texture and the only source of rise in the whole recipe. So I knew I wanted to use good eggs and it doesn't get better than Eggland's Best. They helped me to make batch after batch of delicious popovers. Since I was new to making my own popovers, I did make at least four batches over several weeks. I wanted to see which techniques worked best. You may be able to see from the pictures, that these are several different batches of cheddar popovers. The basic recipe remained the same, but the technique changed a bit with each time. To be honest, they all pretty much tasted the same. But by the end I had figured out a bit more on how to get the big mushroomy top. The keys included a really hot oven, of course. Starting with room temperature ingredients really helped as well. So did using a little extra batter in each well. Popovers are best served warm and fresh. This white cheddar version would be great with an herby butter, maybe a chive butter or even a light garlic butter. They were also really good with raspberry preserves. Just give me one and a cup of coffee and my morning is made! Start with room temperature eggs and room temperature or even lukewarm milk. 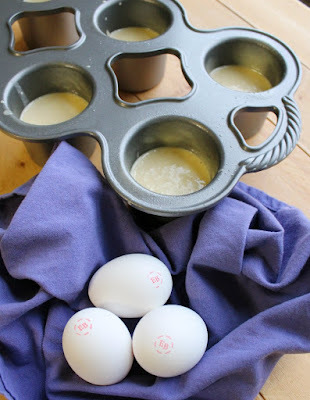 Nordic Ware suggests either buttering and flouring the pan or using the spray with flour. They recommend against just using cooking spray. Mix batter until just combined, don't over mix. You want to start with a super hot oven. Once they are in, don't open the oven to peek. 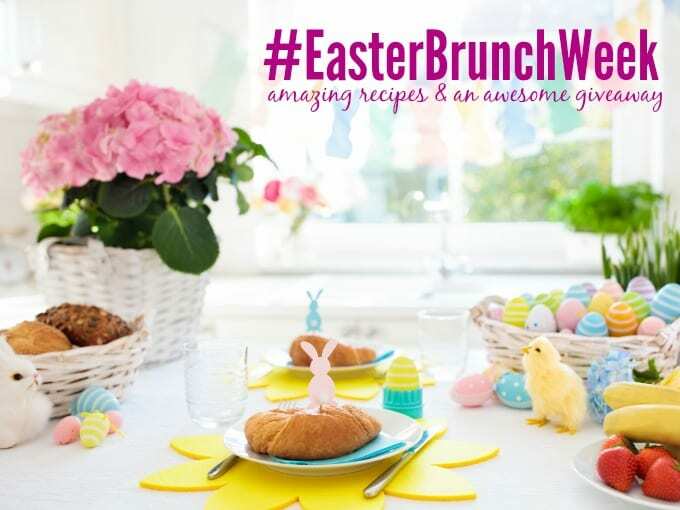 Don't forget to check out the #EasterBrunchWeek fun. 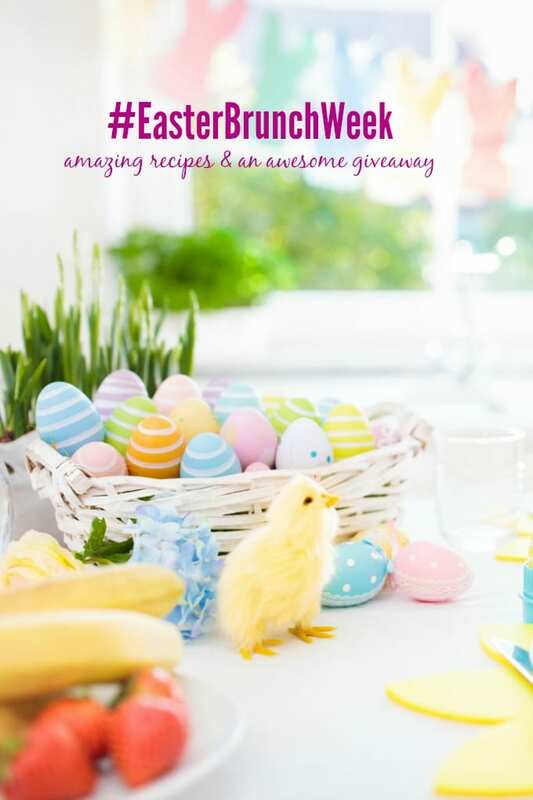 There is a giveaway going on and you can win fun prizes from our sponsors! Preheat oven to 475 F and prepare your popover pan with either butter and flour or flour cooking spray. Whisk together room temperature eggs and melted butter. Add flour, salt, and room temperature or lukewarm milk. Whisk until just combined. Place in oven and adjust the temperature to 450 F. Bake for 20 minutes. Adjust temperature to 350 F and bake for an additional 15-20 minutes. They should be a nice golden brown. Make a small slit with a knife when they come out of the oven to let the steam out. They are best served immediately. Popover perfection! These look so good and yes, would be perfect for brunch! You are the baking queen! 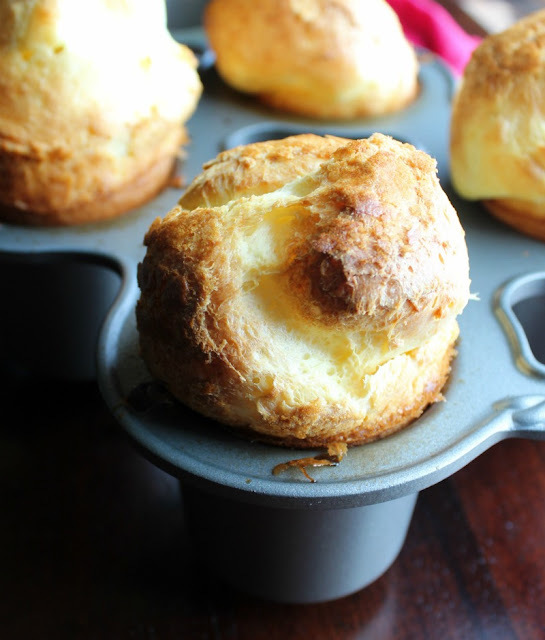 Popover perfection! I make popovers every Christmas but need to make them more throughout the year. That's a gorgeous pan. I was checking these out yesterday while I was at work, and I am excited to try them. Do you know, I've never even tasted a popover?! They are ADDICTIVE!!!!! Try making some ....... you';; be so glad you did!! I LOVE LOVE LOVE popovers!! 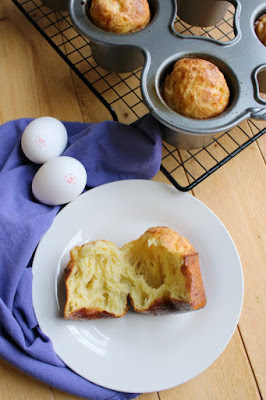 These cheddar popovers are a MUST TRY! Thanks for sharing the recipe!! What do I make for Easter??? A double smoked ham is always on the menu!! 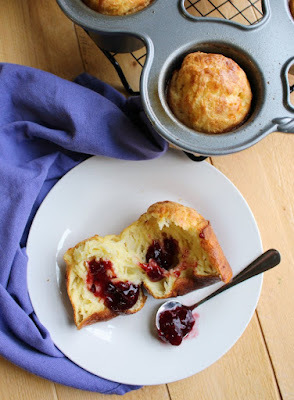 We will love your White Cheddar Popovers, Carlee! Hope you have a very special holiday and thanks so much for sharing with us at Full Plate Thursday.